Hello! My name is Brian (aka: b. smoove from A Gentleman's Ones) and I'll be running the Special Operations: Killzone games at AdeptiCon. We're set to release the updated version of the basic Rules, Missions, and Errata early next week, and we're really quite excited about the way this project has come together! If you haven't seen these rules yet, I recommend taking a quick look at Big Jim’s site, Galaxy in Flames. Big Jim is the brains behind the whole affair and your general one-stop-shop for Killzone glory. The games at AdeptiCon are going to be tremendous fun, with a very strong narrative element and deep cinematic flair. As we've prepared the prototype table for those games, we've come across an element or two that aren't directly addressed in the basic Killzone Ruleset, and I thought here might be a good venue to test out some theories for how we develop those rules. Naturally, all constructive feedback is very much appreciated. The AdeptiCon prototype has been built with a "control panel" that reaches the floor of the room in which it stands. Generally speaking, it's about a quarter inch from the actual door. I've set it to the floor so that a model and get into "base to base" contact with that panel for reasons I outline below. In order to activate a door, open or closed, a model must touch the control panel directly adjacent to the door. The door can only be activated from one of the appropriate panels on either side of the wall. Once the model reaches the panel, it may not continue to move in that phase of the player turn regardless of how much or how little movement remained. The door can immediately be opened or closed, as desired, and the model may still participate in subsequent phases of the player turn. For example, a model that is 3" from the door moves into contact with the adjacent control panel; the door may be immediately opened or closed. The model may not move any further in that movement phase, but may shoot or run, or assault if possible, as normal in the subsequent phases of the player turn. If a door is opened and closed again in the same player turn, there is a chance that it will jam. In any player turn, for every action after the first on the same door roll a D6. On the first roll a 2 or less will jam the door. On the second roll in that player turn, a 3 or less will jam the door. Jammed doors will always close immediately and remain so for the remainder of the game. They may only be opened again through shooting (this rule is designed, obviously, to dissuade players from potentially abusing the opening and closing of doors multiple times in the same player turn). Although a decidedly indelicate solution to any problem, players may of course shoot at a door in an attempt to destroy it outright. A player may NOT shoot at an open door. 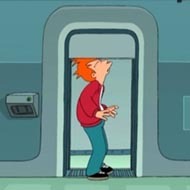 There are three possible outcomes to any such attempt: the door will absorb the energy with no effect (the doors are "hulk" quality and will resist most firearms); the door will buckle in a heap of debris and will count as "jammed" for the remainder of the game (see above); the door will be destroyed outright. Doors have an armor value of 13. Any glancing hit will jam the door (an already jammed door simply remains so). Any penetrating hit will destroy the door outright (if you prefer, flip the door to its "open" position and mark it so that it remains thus for the remainder of the game). 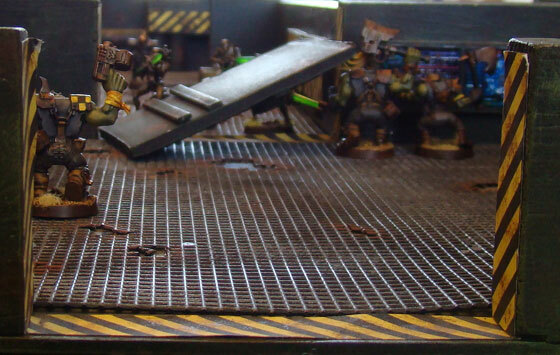 Note: The above images are from the Sin of Alacrity table, not the AdeptiCon prototype. 1. What models are eligible to activate doors? I'd be inclined to not allow units with the Swarm USR to do so. 2. What about shooting the control panel of an open door? Might make it a bit too easy to jam doors open or closed, although you make it entirely random. That is, if you choose to shoot a control panel, you roll to hit as normal. If you hit then you roll to wound against say T4. If you wound then you roll an additional d6, on a 1-3 the door jams shut, on a 4-6 the door jams open. This way it is a gamble and the shooting player can't really control the outcome. 3. Any thought to radius damage when a door is destroyed from shooting? Maybe center a large template on the door and any model under it suffers a S4 hit? 4. Is the armor on doors considered the same as say an armored vehicle? That is, do Melta weapons and the like receive their bonuses? 5. Finally, what about Power Fists and other high strength melee weapons? Maybe the same rules as shoot but no radius damage? Hope we can get some gaming in before the year is out. I don't quite understand the full intent of the jamming rule. I can understand wanted to make opening and closing it in one player turn slightly risky. But why the increasing penalty for further actions in that player turn? It would seem like anyone doing more than that is just wasting their movements. I kind of feel like you should be able to skip shooting and running in order to act on a door, so that the same model that opened a door could close it. Maybe that would lead to abuses of opening--shooting--closing, but that doesn't actually seem that unreasonable to me. All in all though looks pretty good. Blasting through doors and tearing through them with power fists as Matthias suggested above seem like good fun to me. It adds another layer to Killzone's focus on the dramatic. 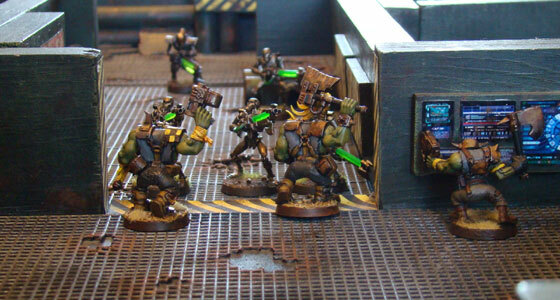 I for one would like to be able to charge a model into combat against one that's become jammed shut. 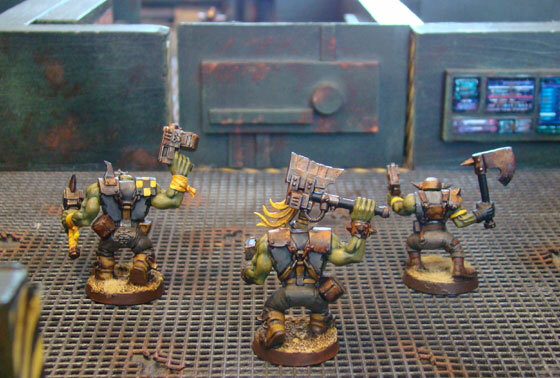 I believe that's one of the reasons why the space hulk clearing terminators' standard armament includes a power fist for each member. Those fists would certainly be an asset when making one's way through all those millennia-old corridors, no doubt filled with all manner of obstacles. My only concern about the jamming rules as presented above is the additional mental bookkeeping required to keep track of whether a door should become jammed on a 2+ or 3+. Even though it's a simple thing, I just wonder if it would ultimately become confusing or bothersome once you've got a lot of teams running around on each board, pursuing their own missions and with the action fast paced and hectic. What about just making a roll each time a door is opened or shut and say it jams in that position on 3+. With a 50/50 chance I don't believe any abuse of the doors as bullet shields would be able to go on for very long. Also I think it would reinforce the atmosphere of playing on a hulk... it's been a long time since those doors we're last maintained after all. You could even introduce special kit to help teams without access to power fists from becoming crippled by doors jammed shut. Las cutters, alloy-dissolving acidic drool, exploding door squigs, could all do the job nicely. Or even just your traditional bundle of melta bombs. Killzone at Adepticon is going to be fun for sure, thanks for making it happen! Oops, what I meant was that the doors would jam on a 4+ (not 3+) to make it 50/50 odds. Sorry about that, cheers! 1. That a great idea. I like it. 2. I like the idea of randomizing this and of removing the element of control. The entire notion stems from the desire to curb potential abuses and your solution seems to fit the bill perfectly. 3. I'm currently working on "damaged door" pieces of scenery (not sure if this will work yet), but I would like to think that any model touching the damaged piece should take some kind of save, etc. Another good idea. Cheers. 4. I believe that the answer here should be yes. Melta still deserves its bonus. 5. For Power Fists, I might like to see a removal of the radius damage, except for those on the other side. hmmmm. @ Joe. Cheers for the feedback. Here's what we were thinking. In playtesting, we noticed that there were several opportunities for potential abuses of the door mechanism (for example, with one model running up, opening a door, the others shooting, then that same model closing the door with a run move -the other team could then do the exact same). Put simply, the notion of a massive hulk quality door opening and closing 4 times or more in a single turn simply didn't fit the bill. To us, this situation seemed both unsporting and unrealistic. To be candid, I was more bothered by the second element there. So, we were looking for ways to keep things both fair, but as importantly, "real." @ Pappa JJ. Cheers mate. I like this idea and agree that we shouldn't make bookkeeping more difficult than it already is. As someone who routinely forgets the medipack he's purchased as an upgrade, I should know this already. Thanks for the reminder all the same.